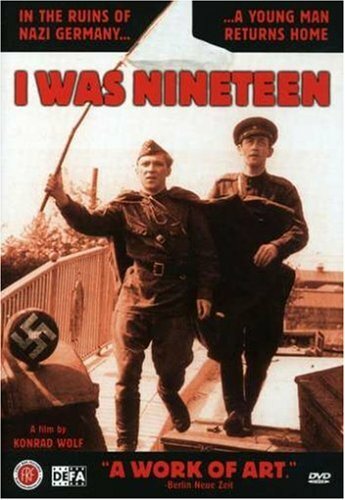 Based on the secret diary kept by acclaimed German filmmaker Konrad Wolf while he was a soldier in the Russian Army, I WAS NINETEEN is the director's most personal film. A highlight of the DEFA collection, Wolf examines his own past through the poetic story of a young German, Gregor Hecker, who as a child fled with his parents to the Soviet Union, but who eventually returns to Germany as a soldier after WWII with the victorious Soviet troops. Suddenly Gregor finds he is different from his comrades in arms, for this defeated land is his home and the Germans he meets upon his return are his compatriots. Gregor is a victor, but also one of the vanquished. As the Soviet troops advance into Germany, Gregor attempts to understand the Germans he meets along the way. His perspective is that of a nineteen year-old, inquisitive, occasionally uncomprehending, and repeatedly dismayed by the atrocities and lies he encounters. Gregor falls in love and simply cannot understand the death of a friend in the last hours of the war - the final death in a long line of deaths that pave his way from Moscow to Berlin. An austere, independent minded work of art, the film not only contains many stories about the last days of the war, but also tells Wolf's own story and uses actual documentary footage from the documentary "Death Camp of Sachsenhausen" (1946), which was one of the first post-war German films about the Nazi period. The DEFA Collection refers to the state-run studios of the German Democratic Republic, or East Germany. Located in the historic "film city" of Babelsberg near Berlin, DEFA was part of one of the world's oldest and most distinguished film traditions. It produced films in nearly all genres including documentaries, feature films, animation and more. I WAS NINETEEN is ranked by film critics to be among Germany's 100 most important films of all time. If you have any questions about this product by FIRST RUN FEATURES HOME VIDEO, contact us by completing and submitting the form below. If you are looking for a specif part number, please include it with your message.